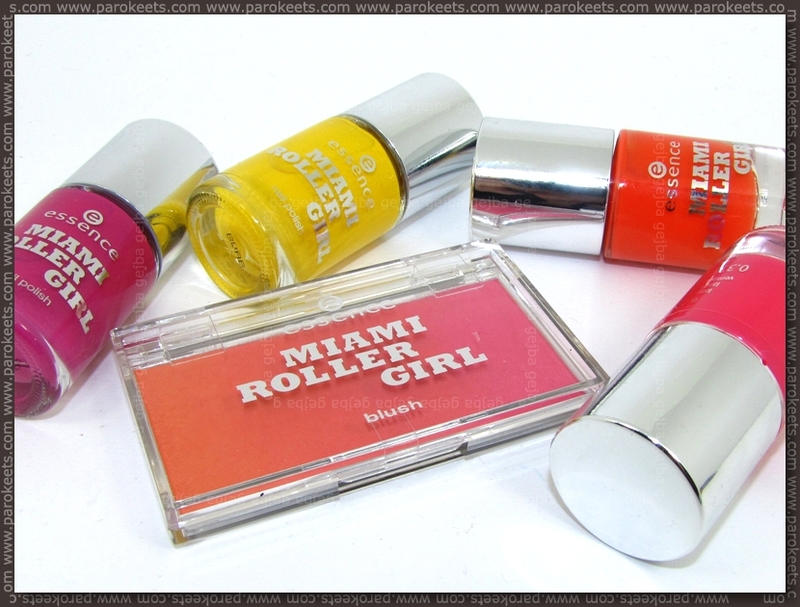 I made a pit stop in Muller just to pick up some milk and stumbled upon full Essence Miami Roller Girl TE. What is girl suppose to do if not buy all four nail polishes and a blush. 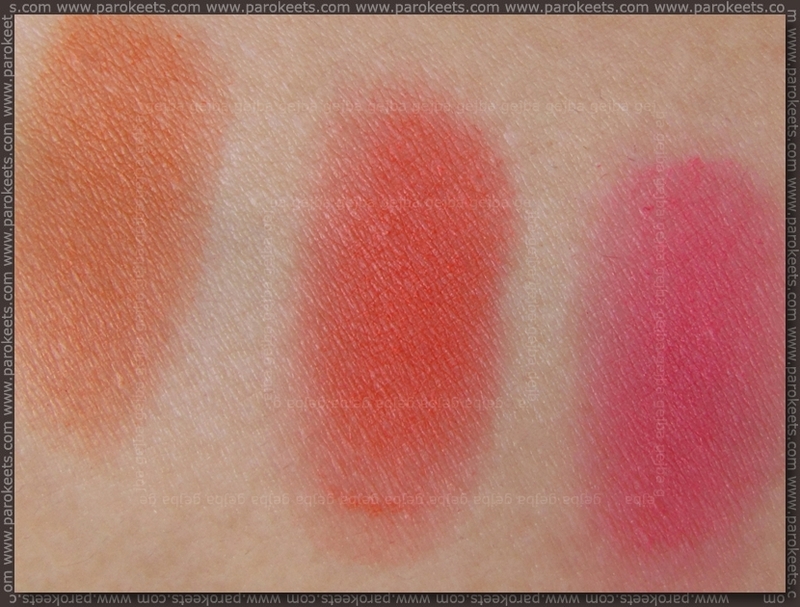 I’ll start with the prettiest product – Essence Dates On Skates blush. 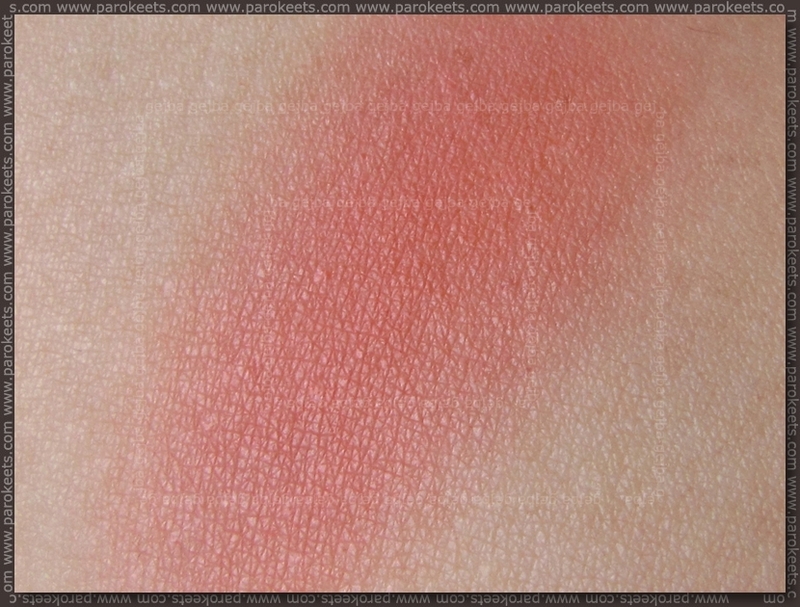 This was pure and simple love at first sight – gradient form orange to pink, great pigmentation, lots of product, no shimmer … With little bit of patience (and right brush) you can get 3 colors out of this blush – orange, coral, pink. Nail polishes are not bad, but nothing really special or even something I need, but I guess you can never have enough cream shades for nail art fun. Brushes and bottles are similar to the Catrice ones. 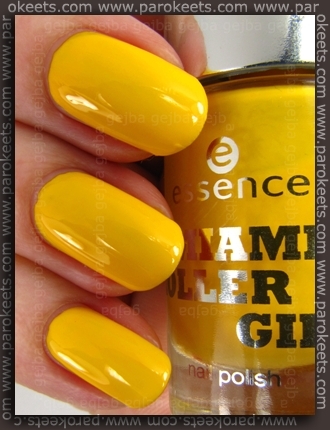 Essence Miami P’Ink is shockingly my fave. Don’t ask … I’m just hoping I’m not about to get ill. It’s nice bright pink which I prefer when the undertone starts to lean to the coralish side … and that does not happen often. Application was easy, full coverage, 2 coats + top coat. Essence Four Wheel Drive is one of those tricky colors just in between pink and purple … but as it looks more purplish (more purple IRL than on the photo) on me I’ll classify it as purple. It can be a one coater, formula is on the thicker side. My brush is little bit weirdly cut, but can be worked with. 2 coats + top coat. Looking for cream yellow which is not that bad to apply? Then you should check out Essence Bienvenido A Miami. It’s one of the least primadona yellows I have met so far. Not piece of cake to apply, but in comparison with majority of other yellow nail polishes out there … OK application (especially if you load the brush). Bienvenido A Miami has good coverage, has slight orangy undertone, with second coat, you get even application. 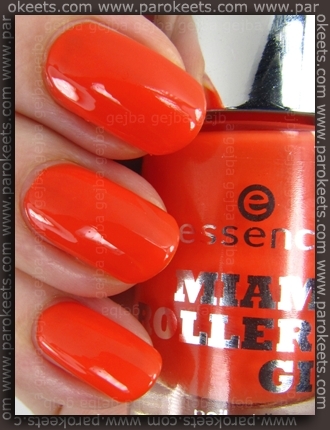 Essence Miami Heat is pretty neutral creme orange shade. This one was the least pigmented of the bunch, but coverage was still not so sheer that VNL would be visible. 2coats + top coat. Recap – blush is a must have, polishes you can skip. Who else bought the blush? Any problems with it? Rumenko mi je – presenetljivo – zelo všeč. Ponavadi sem zadržana do teh preživahnih svetlih barv ampak se mi zdi izbira barv zelo posrečena. I guess the star product in this LE is the Blush. You can even get 3in1. I doubt I’ll be lucky enough to get my hands on this, though. Mislim, da samo v Mullerju. Tale blush je enkraten za potovanja – 3 barve v enem! Edino za embalažo nisem prepričana, kako bi se obnesla. Laki res niso nekaj ekstra, ampak blush mi je pa :wub: .